Comes equipped with 240V electrical for standard service. With the growing demand for high quality deaired clay for high production applications, the newly released VPM-100 carries a colossal “bang-for-the-buck” as the largest Vacuum Dearing Mixing Pugmill on the market today. Known as a “working mule”, the VPM-100 leverages off the PM-100 design originally unveiled in 1975. However, Peter Pugger has incorporated a “chainless”, maintenance free geardrive system, state-of-the-art VFD technology, updated vacuum chamber and robust auger design that embellishes the quality and performance that our customers around the world have come to expect. Stainless Steel: Shaft, augers and paddles of stainless steel, along with an aluminum mixing/pugging chamber ensures rust-free clay processing. Large Hopper: The oversized hopper door allows for easy loading of up to 250 lbs. of clay per batch. Pugmill Output: Switch to PUG after a batch is completely mixed, and the Power Wedger unloads itself in the form of 4″ diameter deaired logs (standard). Vacuum Deaired: Each batch can be deaired by starting the vacuum pump during the last stage of mixing, leaving an air-free product when pugged out (no need to run the clay through the pugmill multiple times). Once the entire batch of clay has been deaired, switch the pugmill to PUG, and press start. Any remaining deaired clay in the machine can be stored for later use without having to remix or deair. Our patented vacuum design (Click here for full list of patents) allows us to deair the entire batch of clay without the use of cumbersome vacuum/shredding screens, or down time due to a clogged pugmill! No other mixing pugmill on the market matches the Peter Pugger’s effectiveness at deairing clay. We guarantee it! Sealed Chamber: Here in our Northern California Factory, each pugmill casting has precision CNC machined o-ring grooves incorporated into them which allows the pugmill to effectively store moist clay indefinitely! No other pugmill on the market provides this level of precision when it comes to properly sealing all pugmill surfaces. Patented Vacuum Chamber: The Patented Vacuum Chamber serves as a separation chamber between the processing chamber (where clay is mixed and pugged) and the gear drive system. In the event the pugmill is overfilled, the excess clay is collected in the vacuum chamber where it can be easily accessed and redirected back into the processing chamber in time for the next batch (if necesary). The Vacuum Chamber door is designed to disengage before excess clay can generate enough pressure to damage the gear drive system. This is a key design feature for mixing pugmills where clay is being forced up against the rear of the processing chamber during the mixing cycle. Peter Pugger is the only mixing pugmill to provide extra protection against vacuum and bearing seal exposure resulting in maintenance free operation (Click here for full list of patents). Variable Speed Control: This allows the operator the ability to speed up or slow down the pugmill. This is especially useful when extruding through dies. Because of the back pressure generated by a large amount of clay being forced through a small orifice, the speed control allows the operator to slow the pugging as required. In turn, perfect deaired configurations are easily extruded through the Pugger-Mixer. There are additional advantages if you are a “single potter studio”. The ability to slow the pugging allows for time to place pugged clay into containers or bags. On Wheels: The VPM-100 comes with 8″ diameter wheels. It is easily transported for cleaning and storage. Work Surface: The motor and drive are enclosed for protection, cleanliness and safety. A 24″ x 20″ cleanable work surface is provided on top for convenience of the operator while loading. Vacuum is provided by 2 double-headed rocking piston type diaphragm pump. These new technology pumps are the simplest and quietest vacuum source available. They are maintenance-free and long lasting. 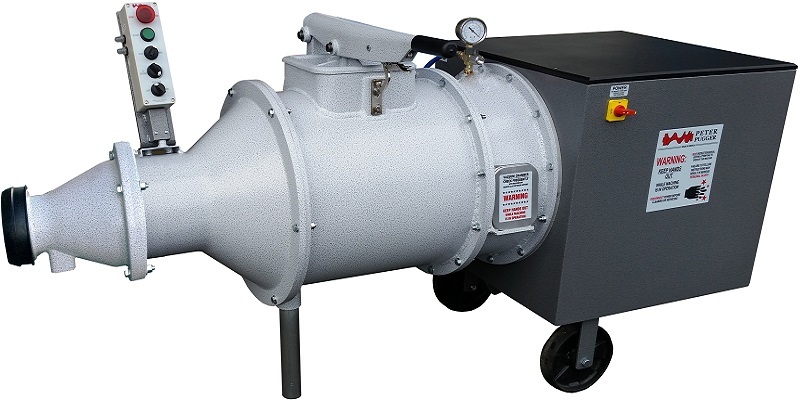 The VPM-100 Power Wedger does not require a large vacuum pump because the clay is continuously exposed to vacuum in the sealed mixing chamber. Once the clay chamber is evacuated, the vacuum pump can be turned off. Mix moist clay from powder and water. Reclaim scrap – wet or dry. Blend two or more different bodies. Add materials (wet or dry) to an already moist body. Adjust moisture of an already wet body. OR just mix 25 lb. bags of clay – literally warm the clay by mixing it.